Lying between Martinique and St. Vincent, St. Lucia is another peak in the Windward chain, with slopes that soar from the sea to a central mountain spine crested by Morne Gimie at a height of 3, 117 feet. 27 miles in length and 14 miles across, St. Lucia has an active volcano called La Soufriere, which is a bubbling, sulphurous mass with the distinction of being the “only drive-in volcano in the world”. 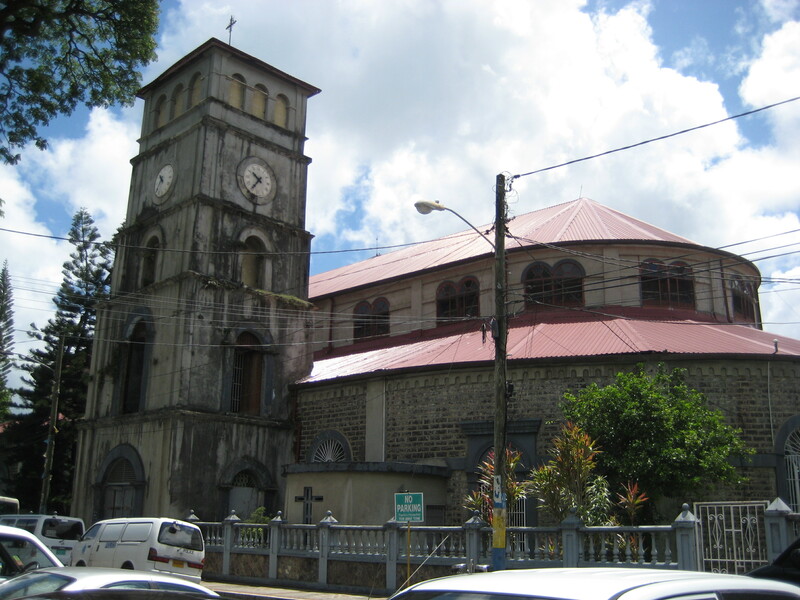 The population of 145,000, are of mostly African descent and more than a third live in the sprawling northwest coast capital of Castries. Agriculture is the mainstay of the economy and 70% of the island’s earnings come from the export of bananas. There are 2,000 banana farmers on St. Lucia, and on market day, the children regularly play truant, just to help their parents carry the crop to the processing plant. The trademark of the island is its twin peaks known as Gros Piton and Petit Piton. These two spikes of lava over 2,500 feet high have been a sailor’s landmark for hundreds of years. We did not have a tour scheduled so we walked about twenty minutes into the town of Castries to have a look around. In the peak of the season, the town receives as many as four cruise ships a day, so it is well equipped for the shopping tourist. Several large market halls surround the port with one souvenir stand after the next. The items being sold ranged from spices, jewelry, clothing, shells, woodcarvings, to refrigerator magnets. None of the merchandise looked to be of particular quality, but rather an abundance of mass-produced merchandise. We visited the Cathedral of the Immaculate Conception, built in 1897 and located next to the main public square named after Derek Wolcott, who was a local poet and Nobel laureate. 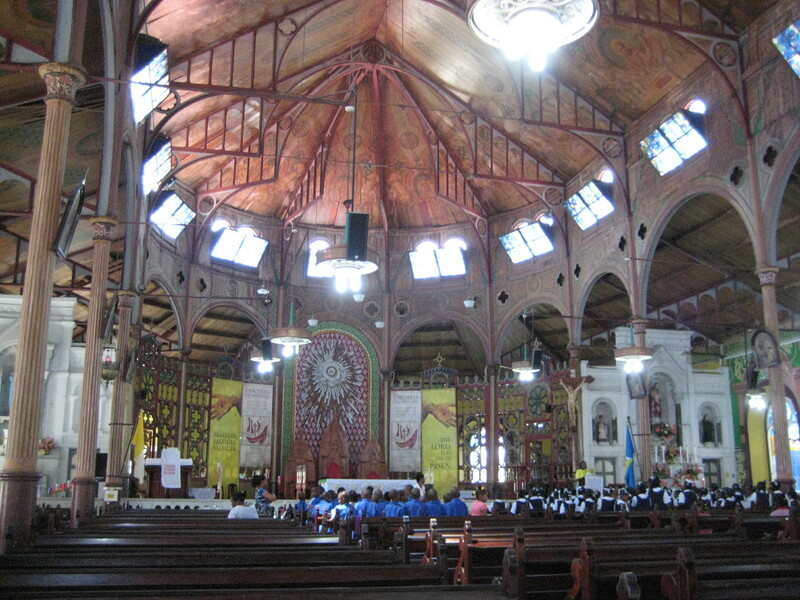 The church is a beautiful wood constructed church with intricate hand painted ceiling and walls. On this particular day, there were a large number of children attending bible study, dressed in uniforms and singing hymns and reading bible verses. 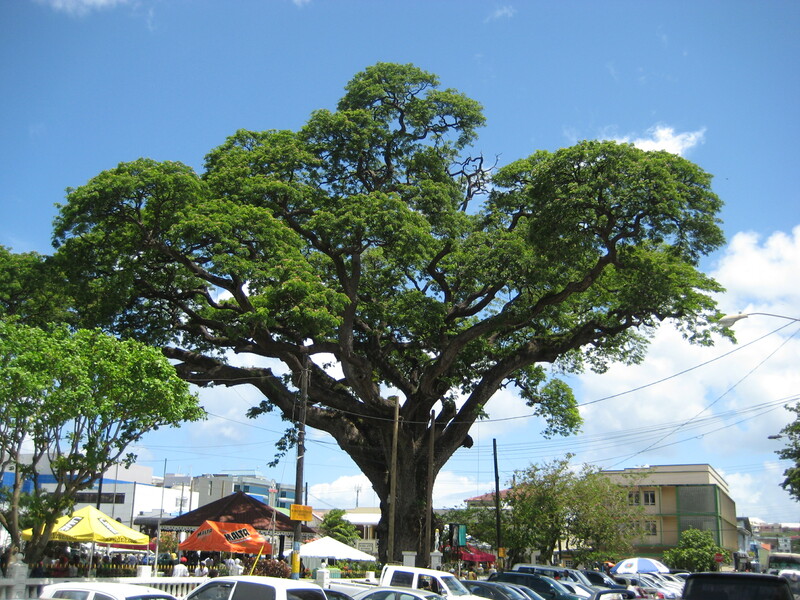 Outside the church in the square is a gorgeous 400-year old Samaan (rain) tree. We wandered the hot and humid streets of town poking our heads into several shops to check out the merchandise and observe the locals doing their Saturday shopping. We stopped for a coffee at a local coffee and pastry shop in a small indoor mall where we used the Internet. We found the locals to not be very friendly, and with nothing of interest to explore in town, we headed back to the ship. Onboard the ship, we were treated to a local entertainment group called the Lime Diamond Steel Orchestra. They played a variety of different types of music on a variety of steel drums. They were excellent musicians, playing for an hour without a piece of music. Late afternoon, we had our last sail away party as we headed home towards Ft. Lauderdale. It was now difficult to pretend that this extraordinary adventure was quickly coming to an end and soon we would be back home dealing with the reality of everyday life. The evening’s entertainer was a gentleman from Las Vegas by the name of Doug Starks who calls himself Mr. Entertainment. He sang a variety of music and told jokes; unfortunately his act was a bit flat.